The delightful Dunkaroos snack was in its heyday in the ‘90s. Kids loved to find them in their lunchboxes and they made the perfect after school sweet-treat. The ounce-sized packages contained little graham crackers and a pocket of rainbow-sprinkled frosting for dunking. It’s still well loved by kids of all ages, but to our dismay, it has been discontinued. Fortunately, there’s still plenty of Dunkaroos fun to be had with this celebration cake! I’ve taken inspiration from the rich vanilla rainbow sprinkled version with cinnamon graham crackers. You could also make a chocolate version by replacing the Betty Crocker® Whipped cream frosting with Betty Crocker® Whipped chocolate frosting. 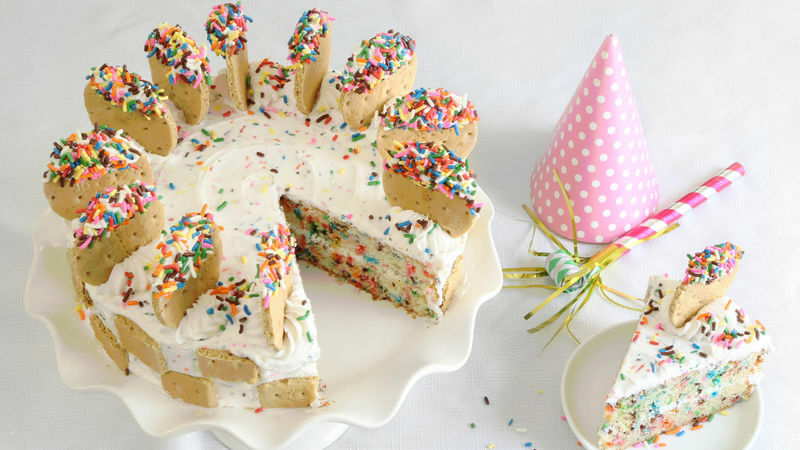 Be sure to stock up on rainbow sprinkles before starting this cake. I suggest using Betty Crocker Sweet Toppings Carousel Mix. They hold up best during baking and won’t bleed when mixed into the whipped cream frosting. Step 1: First you’ll need to mix up all the ingredients for the cake mix. Gently fold in the 1/2 cup of rainbow sprinkles. Step 2: Pour the batter into two greased and floured 9-inch cake pans and then bake as directed on the cake mix box. Step 3: When the cakes are cooled, level the tops slightly so they’ll have a nice even profile when assembled. Step 4: Pour the contents of one frosting container in a medium bowl Mix in the rainbow sprinkles with a large spoon. Step 5: Place a cake layer on a cake stand or serving platter. Cover with a thin layer of frosting. Step 6: Place the remaining cake layer on top and cover in frosting. Step 7: Evenly cover the entire cake with the sprinkled frosting. Step 8: Chop eight of the graham crackers into small pieces with a sharp knife. Step 9: Press the graham crackers randomly onto the sides of the cake (or in a staggered pattern, like I did). Step 10: Place 2/3 cup of plain frosting in a piping bag fitted with a large star tip. Pipe rosettes around the edge of the cake. Step 11: Cut the remaining graham crackers into a circle shape with a small round cookie cutter. You could also just break the graham crackers at the perforation and use rectangular pieces. Step 12: Place the remaining frosting in a small bowl and have a cup of rainbow sprinkles at the ready. Dunk the round grahams into frosting and then into the sprinkles. Step 14: When all cookies are assembled on top of the cake, toss on additional sprinkles.